Locksmith St. Louis: Welcome to Our Blog! Imagine how miserable it would be: late for work, the rain pouring down outside, and you realize your only umbrella is locked in the car—along with your car keys. It’s not exactly the most auspicious start to the day, but these situations are more common than you’d expect. Everyone, at some point or another, has probably been in a situation that needed a locksmith. Often, when you think of locksmith services, you think about situations just like this one; however, locksmith services extend far beyond the emergency locked-my-keys-in-the-car situations most imagine. At Rocket Locksmith, we want to be sure you get trustworthy locksmithing services when you need them, but we can do so much more! Stay tuned to our blog to learn more about the variety of locksmith services you may not know about. How often have you locked the doorknob and pulled the door shut on your way out, only to realize that your keys are hanging on the key hooks right next to the door? As you imagine, your local locksmith can let you back into your house in a jiffy so you don’t have to worry about climbing up to the one second-story window you occasionally leave unlocked—seriously, don’t do that. In addition to emergency locksmith services, the knowledgeable team at Rocket Locksmith can offer an assessment and services to help check over and improve your home’s security. When you move into a new home, you should always rekey the locks as a first step toward better home security—there’s no way of knowing how many key copies were made and how many people could potentially have access to your home that way. Rekeying locks is a great way to make those old keys cease to work without changing out any of the hardware on your doors. Or, for even more security, we can replace or install new locks, including keyless entry systems! Anything that we can do to improve the security of your home, we can provide for your business just as easily. Do you need a master key system installed and keys made for your managers? Would you like a security assessment to ensure your building is secure enough? The locksmithing team at Rocket Locksmith can come provide an analysis and quote for ways to keep your employees and assets secure. Did an employee accidentally lock the only set of keys inside the office? We can come unlock your business, give you access to those locked-in keys, and make a duplicate set so the issue doesn’t happen again. Or, to give you better control over who enters, ask us about installing a keyless entry system, which will allow you to set codes instead of worry about keys. Getting locked out of your car, no matter the time of day or night, can place you in an unsafe position. 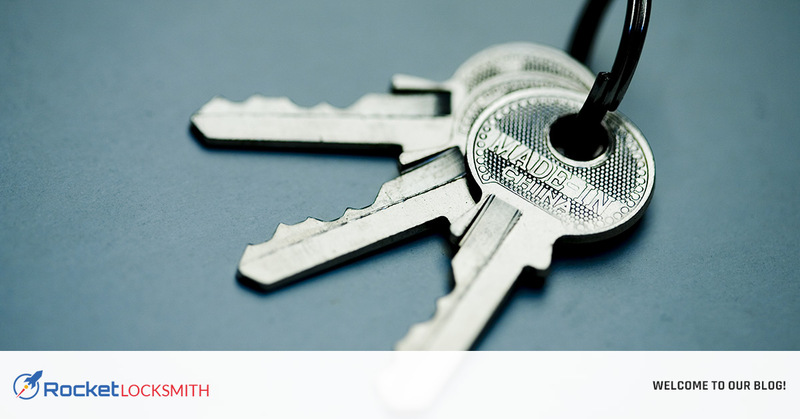 When you give us a call, we’ll send our nearest locksmith so you can get help and get on the road again quickly. In addition to emergency locksmith services, we can repair and replace car keys, including transponder keys and electronic fobs—no more going to the dealer and waiting for hours when one of our professional locksmiths can handle that for you! Did you have a key break off in the door or do you have issues with your key not turning in the ignition? Call your local locksmiths at Rocket Locksmith before wasting hours at the dealer. If you need help with lock or key, let the knowledgeable team at St. Louis’ Rocket Locksmithing help you out. Contact us today to learn more or schedule service!